Having learned that 76% of white women voted for Kemp over Stacey Abrams, I am looking for a new demographic to join. Then Bernie Sanders, the internet’s favorite socialist savior, went on record with The Daily Beast (full disclosure, I work for them) in saying that white people are “uncomfortable” voting for black people. All in all, it’s been a doozy. Thankfully, CNN’s Brooke Baldwin offers a glimmer of hope. 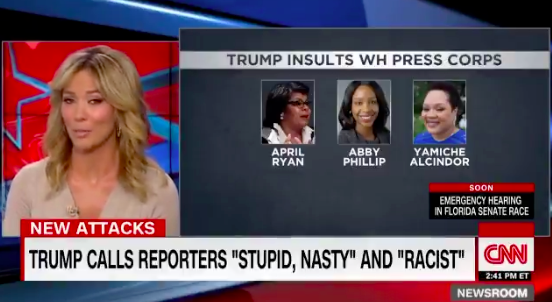 The anchor called out Trump’s bigoted insults on April Ryan, Abby D. Phillip, and Yamiche Alcindor, whom he referred to as “racist, stupid, and nasty” in her closing remarks. We have a long way to go in our journey toward allyship, but this was definitely a step in the right direction. Don’t call yourself an ally if you’d never stick your neck out for a woman of color. Watch the clip for yourself.